So is the consensus to pick rows 20 and 21 since row 19 will be missing come closer to departure? Now it became 24E (Bulkhead Middle!!) on Non PE 777-300ER setting. It changed again to PE 777-300 a day before the departure. Originally on this plane. However, my domestic flight got delayed and rerouted to UA807 IAD-PEK. That's what I do. Then Watchitlikeahawk. thanks. It switched at 48 hours. Thanks to your “watchitlikeahawk”, was able to get two aisle seats instead of window and aisle together when the computer pushed my premier gold relatives back to like the thirties. Hopefully they don’t do this to a 1K. You need to continue to watch your seats when originating from a HUB airport right up to and including 2-3 hours before departure due to last minute aircraft swaps. On 02/22 SFO-NRT, I was flying an inbound flight to SFO and about 3 hours before my actual SFO-NRT departure, they switched the aircraft from a new PE aircraft to back a non-PE aircraft. Luckily I was refreshing the UA mobile app every half hour or so during the flight, or we would have been knocked back to some non-desirable seats. I was able to switch mid-flight. I am watching my flight next week. It does seem like they firm up the seat map about 48 hours before (subject of course to other swaps later) - but it has consistently gone out with new config last 2 weeks. They did it to me and I am 1K. Hence watchitlikeahawk. Polaris 772 on ORD-HKG Sunday March 3? Anyone know why UA has a Polaris plane on the ORD-HKG route this Sunday (March 3)? It just seems to be THAT day. Because they're in the middle of retrofitting the fleet, but they don't start to firm up aircraft assignments until about 3 days prior to the flight. So, they use an interim (non-Polaris) seat map until that happens. It could still change back to the older config. But the seat maps for other days are still the old one. Because not all of the fleet has been retrofitted. Actual aircraft are only scheduled a few days out. Unless they have dedicated aircraft on certain routes, like with upcoming launch of Premium Plus, the retrofitted aircraft will only show up only a few days before. And even then, it carries the risk of being swapped to a non-retrofitted plane. Currently ABOUT 50% (a little more) of the sUA 772s have been converted from the old IPTE layout to the Polaris Layout. 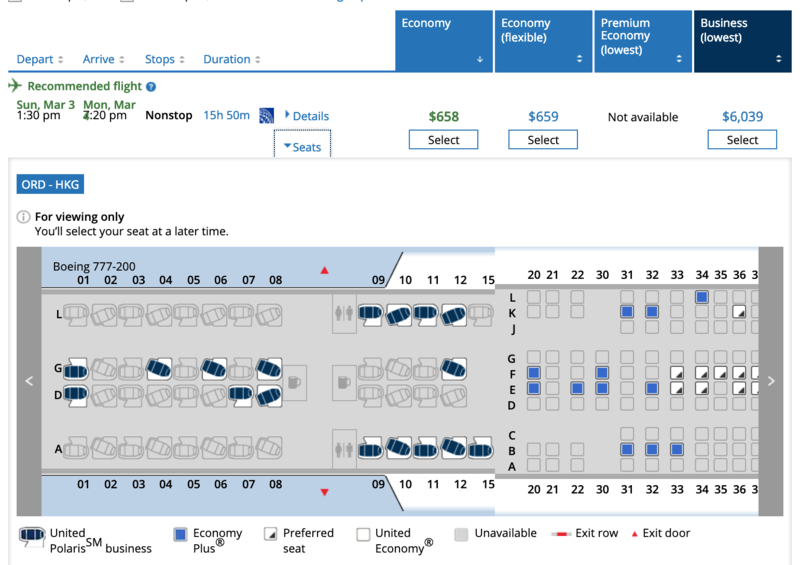 As mentioned above, United doesn't know which particular layout will be on which flight ahead of time. Aircraft aren't assigned to a specific flight until about 72 hours before the flight, and there can even be a swap after that. The rule of thumb is you won't know with 100% certainty what type of aircraft you will be on until you actually board. UA decided to display the old IPTE layout as a placeholder until they know which aircraft they will be using for that flight. While we don't know for sure, it is probable that UA prefers to delight people who are not expecting a Polaris layout with a Polaris layout, rather than have people expect a Polaris layout and then have a bunch of disappointed people when the Polaris layout gets "yanked" for the old layout when an aircraft is assigned. This also applies to routes that use the sCO (ex-Contonental) 772 and all of the 763s. United is at a tough point for guaranteeing seat assignments on its wide-body fleet. You are only safe on a 777-300 (77W) or any of the 787s, where there is only one layout for all aircraft of each type. United's goal is the have 100% consistency among similar aircraft when the retrofit process is complete, with a goal of the end of 2020. TomA and narvik like this. For past days that's what was flown. For the future they don't know. For Mar 3 is seems they currently plan to have a Polaris version fly. The practice has been to use a modified version of the IPTE 772 seat map with 3-4-3 economy seating but seats blanked out, and then switch to the fully correct map (either old 772 or P772) at around T-72 to T-48. 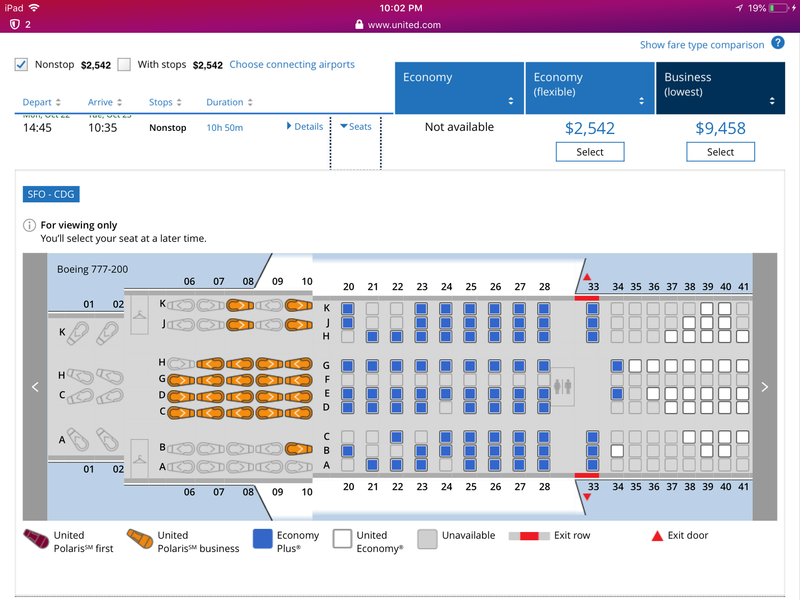 So you're seeing either confirmed planes using actual seatmaps or the placeholder for future dates. Ua does not use the same specific aircraft on a given route -- for various reasons, specific aircraft could be on multiple different routes over a given time period.